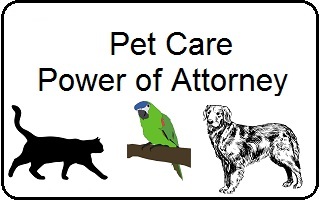 A Pet Care Power of Attorney allows a pet owner (principal) to appoint a pet caregiver as agent or attorney-in-fact to take care of a pet when the owner is not available or not able to provide care due to work, other duties, travel, vacation, illness, injury or incapacity. The power of attorney can be limited or broad, covering one or more categories of pet care including food, shelter, boarding, grooming, exercising, routine and emergency medical care and final disposition if the pet dies. In the U.S., about 62% of households own pets, with dogs in 37%, cats in 30%, fish in 7%, birds in 3% and horses in 1.6% of households. Many households own multiple pets. Households with dogs, cats and horses average two visits to the veterinarian each year, with annual routine vet expenses of $100 to $200 per year. For 2017, U.S. households will spend $69 billion on pets for: food $30 billion, vet care $17 billion, supplies/OTC medicine $15 billion, live animal purchases $2 billion and other services $6 billion. The average annual cost of owning a dog is $1100 and $800 for a cat. Different situations use different types of pet agreements. A power of attorney is often used when a trusted family member or friend will care for your pet when you are unable to provide pet care. There is usually no compensation paid, only reimbursement for any expenses paid by the agent. You can estimate the monthly pet expenses and provide the funds in a pet care account. See sample Pet Care Power of Attorney, Notarized. If there is no family member or friend available to care for your pet, you might hire a paid professional pet caregiver or pet boarding business and use a pet care agreement. They will likely have their own written agreement. Include provisions for routine and emergency pet medical care at a vet in case it is needed. See sample Pet Care Agreement, Notarized. Or, you may wish to sell the pet, using a Bill of Sale for Personal Property. For estate planning, when you become incapacitated or die, a pet care trust or a pet protection agreement may be used to provide care for your pet in your absence. See sample Pet Protection Agreement or buy a Pet Protection Agreement from LegalZoom. It is good practice to use a notary to notarize a pet care power of attorney or agreement. A service provider or document recipient may require a notarized POA.